Yet another ruling from the dark ages regarding lost property ….. The new halachic ruling, issued by Rabbi Nissim Karelitz, states that banned cellular phone are not considered a property which, if lost, must be returned to its owner according to the Torah. 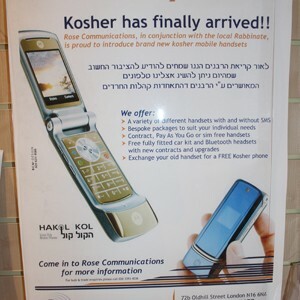 Halachic ruling issued by Rabbi Karelitz says because advanced cellular phone is ‘not kosher,’ there is no obligation to give it back to its owner*An innovative halachic ruling issued recently states that there is no need to return a lost “non-kosher” phone to its owner. The ruling was given following an incident which took place in a bakery in the central city of Bnei Brak, when a saleswoman refused to return a smartphone to its owner. The case sparked a halachic debate on social networks on whether the saleswoman had violated the “thou shalt not steal” commandment. Meanwhile, a new court on communication affairs was established in the ultra-Orthodox sector at the initiative of Refael Meir, the brother of haredi journalist Yedidia Meir. The court will headed by five leading rabbis, who will issue rulings on the use of cellular phones and the Internet. The decision to set up the new institution was made during a meeting held at the home of Rabbi Chaim Kanievsky, one of the leaders of the haredi Ashkenazi public. The court will also run a PR campaign against haredi websites which rabbis have ordered their followers to boycott. Some of these websites have been taken down as a result of the boycott calls, yet many other websites have been launched recently. Gee, I am dumbstruck about the behavior of these people and their culture. Let me guess? The phone originally belonged to a non-jew? Palestine is “not kosher” either… why don’t they give that back!!! And while they’re at it, why don’t they give back the billions of dollars that the US gives them in “aid” every year!!? I’m pretty sure that the money is NOT kosher… but then again, it is money, right? SO I GUESS IT’S KOSHER!!! !